As usual, the Village People's "In the Navy" rang out during London's annual gay pride parade on Saturday. For 22 of the marchers, it was true. Wearing crisp navy blue jackets with gold striped cuffs, shining medals and ivory shirts, 22 Royal Navy personnel marched openly in uniform for the first time in the annual pride parade through central London. "To be quite honest, it's a dream come true," said Petty Officer Karen Surtees, a navy medic based in Gibraltar. "I'm so excited about it, I felt ill this morning. We can express who we are, what we are and wear our uniforms in pride today." Surtees said she joined the force 14 years ago, when being openly gay meant losing her job. She, like many others, kept quiet about her sexual orientation for years. The British government lifted a ban on gays serving in the country's armed forces in 2000 after the European Court of Human Rights ruled that the restriction was a violation of human rights. Since then, soldiers and Royal Air Force personnel have marched officially in pride parades, but Saturday's outing was a naval first. "After 23 years in the navy, mostly closeted, this is tremendous," said Commander David Walker, 47, of West Mersea, England. "It tells the general public the navy is gay friendly, and it tells the dinosaurs who think this should be swept under the carpet that the top brass supports us." Behind the sailors, thousands of revelers trailing pink, red and white Union Jack flags and rainbow balloons danced, cheered, paraded and lined the streets. Police said about 40,000 people participated. "We've fought long and hard to have equality," said Thomas Haywood, 34, of Edinburgh, Scotland. "Today is a real celebration." This year's march was the culmination of EuroPride, a two-week gay, lesbian and trans-gender festival held in a different European city each year. LONDON (Reuters) - Thousands of gays, lesbians and transvestites from across Europe paraded through central London on Saturday to proudly state their sexuality. Amid a fleet of gaudily decorated floats with blaring music, whistles and dancers the marchers flowed down the shopping magnet of Oxford Street, past Nelson's Column and down to the Houses of Parliament watched by the amused and the bemused. "It has been great. Everyone was very accepting. There was no abuse, just support," Europride local organiser Emily told Reuters. "This is a great public relations exercise for the gay and lesbian world." Organisers had hoped the blazing sunshine and the fact that the march did not clash with the England versus Portugal World Cup match would bring up to 500,000 onto the streets. But police said in the end just 40,000 took part in the incident-free event whose theme was "Pride against Prejudice". Last year's London Gay Pride march -- an annual event in the city for more than 30 years -- attracted some 250,000 people even though it coincided with the Live 8 concert in Hyde Park. While pink was predominant on Saturday -- including a forest of red, white and pink, instead of blue, Union Jacks -- it was by no means the only colour in a kaleidoscopic show. Costumes ranged from skimpy briefs to outfits evoking Brazil's Mardi Gras, with a scattering of cowboys, sailors, soldiers, police, fairies, goths and even everyday garb. Banners declared "Pride" and urged people to come out of the closet and declare their sexuality, and there was even one declaring "No to Islamophobia. 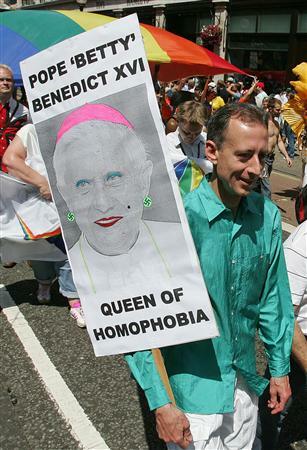 No to homophobia". Thousands of people have attended a huge parade marking the end of a two-week European festival of gay and lesbian culture. Streets in central London were closed as marchers, floats, dancers and bands led the EuroPride procession. Spectators cheered as the parade, including a giant rainbow flag, wound its way towards Trafalgar Square. "It shows to the world what London is, the world's most diverse, gay-friendly city," said organiser Jason Pollock. 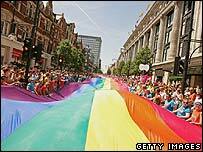 Mr Pollock, EuroPride London 06 chief executive, said the festival had drawn 750,000 people to the capital. A Scotland Yard spokesman said about 40,000 people had turned out for the parade. About 40 Royal Navy personnel paraded in their uniforms for the first time at the march. Army and RAF personnel were not given permission to take part in their official uniforms, however. The parade travelled along Oxford Street and Regent Street then on to Piccadilly Circus and Trafalgar Square, then Whitehall and Victoria Embankment. Mayor Ken Livingstone, who was at the front of the parade, said it was a chance to celebrate the lesbian and gay community's contribution to the city. He said: "What this shows as we march through the city of London - one of the greatest cities on earth - is a city can be a wonderful place to live in with people of every race, religion and sexuality."